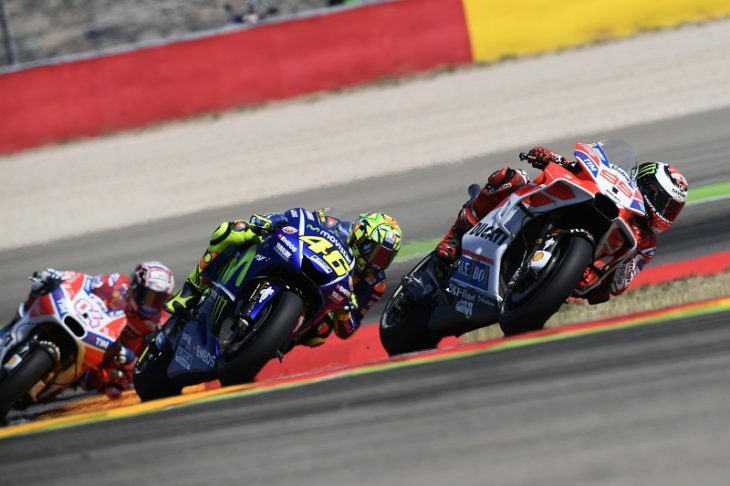 Jorge Lorenzo stepped onto the podium for the second time this year at the Aragón Grand Prix with a third place finish in the fourteenth round of the season. Today’s race was held on a splendid sunny day in front of a massive crowd of over 70,000 spectators. The Ducati Team’s Spanish rider powered away well at the lights to take the lead into the first corner, and he remained in that position for the first fifteen laps. On lap 16 Jorge was passed by Marquez and by Pedrosa three laps from the end and as a result he crossed the finishing line in third place, two seconds down on the winner. Seventh place at the flag went to Andrea Dovizioso, who started from the third row. The Italian fought with the leading group for half the race, holding on to fourth until lap 14, and he then found himself in a great battle with Rossi and Viñales but he wasn’t able to defend his position in the final stages and finished his race in seventh place. Dovizioso now lies second in the overall standings with a 16-point gap from leader Marquez while Lorenzo moves back up to seventh place on 106 points. The MotoGP world championship will be back on track for the next round at the Twin Ring Motegi circuit in Japan from 13-15 October.